Like many of you, I’ve struggled to get good jobs and succeed professionally. On my road to success, I’ve encountered more than my share of bumps, rocky roads, and steep hills–and my car has broken down every once in a while too. It’s been a tough journey, but I’ve learned a lot along the way. I’ve worked in over fifteen different jobs for a variety of supervisors. I’ve spoken with recruiters, submitted hundreds of job applications, and attended dozens of interviews. I have even sat on hiring committees, so I’ve had the opportunity to see the hiring process “from the other side of the desk,” so to speak. I’ve learned that while there may be no single magic answer to success in the working world, there are definitely still things that we can all do to gain the upper hand. I hope to share the wisdom of my experiences with you. And don't forget to visit my website at www.paulinewadley.wordpress.com to join my email list to stay up-to-date on new book releases and other news! As a thank-you, I’ll send you my secret weapon to interview success! 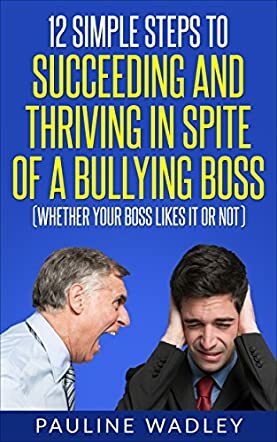 Pauline Wadley's 12 Simple Steps to Succeeding and Thriving in Spite of a Bullying Boss (Whether Your Boss Likes It or Not) is a useful guide to all those who need help in handling a nasty boss. This book will help them in becoming optimistic and excited for the future by the time they finish reading. The author gives good techniques and strategies on how to use the current unpleasant situation to their advantage so that they can thrive and succeed. Everyone deserves success and the author teaches readers how to lay the emotional groundwork to build up the emotional strength to start the journey. The eight specific ways shared in the book can be used to improve everybody’s current negative situation and build invaluable professional skills. The book is insightful and the author has handled the topic well, helping readers incorporate the tips into their professional lives so that they develop skills while moving on to better employment opportunities. Instead of devoting all one's energy on figuring out how to keep the job, the techniques in this book will help one to focus energy on how to learn from the job, develop, and build a future. The simple self-care ideas are helpful to get started. I like the topic chosen by the author for a book because it is not only relevant, but also helpful to many readers who are struggling when it comes to handling a difficult or unpleasant boss. It will also encourage and motivate readers to become confident and attend more job interviews.